The VCA VU won't replace all existing compressors, but it can certainly augment your collection with its distinctive sound. Couldn't be easier to use. Classic compression controls. Great sound. No attack/release. Unusual sound may limit its use. Before the home micro boom, the average computer used reel-to-reel tapes, was the size of a shed and gobbled up enough electricity to power a small village. Digital audio processing was in its infancy in the late 70s, and computers were simply nowhere to be seen in recording studios. Instead of drooling over plug-ins, audio engineers would daydream about the hardware they'd like to install in their tastefully wood-panelled room, and near the top of that list was the dbx 160, commonly referred to in the years since as the 'VU'. Dbx have an illustrious legacy, particularly in the Field of compression, and the original VU has admirably stood the test of time, remaining highly sought-after for its distinctive and original sound. But what if you can't locate one or, understandably, don't want to use hardware effects in your setup? Universal Audio, highly regarded for their stable of DSP-powered plug-in emulations (big names such as Neve, Fairchild and Pultec are all 'copied'), have the answer in the shape of the all-new VCA VU plug-in. This is a faithful emulation of the dbx 160, running on the well-established UAD DSP platform and thus bringing its classic sound into the digital realm. Universal Audio's analysis of the original VU led them to realise that the unit's character came from its VCA (Voltage Controlled Amplifier) design. It also had an unusual detection circuit, leading to an individual and non-linear attack/release behaviour. Loading up the VCA VU plug-in, you're presented with a kitsch wood-effect GUI, almost identical to the original hardware model. The controls are pretty minimalist - just like the real thing - with a Threshold knob, Compression dial (basically a ratio control ranging from 1 to infinity), and an Output Gain control. Also included are push-button controls for the retro-style meter, so you can view input or output level (post-gain) and the total gain change after compression, and a bypass switch. The lack of attack and release controls may bother some users, but then they would be missing the point of this emulation. It's easy to get the VCA VU pumping away. Correctly adjusting the Threshold knob to get the unit working is simple, thanks to the Above and Below threshold lights. For such a basic unit, the VCA performs well across a range of applications; on the one hand, it's able to bring entire mixes under relative control, while on the other, it can lend serious percussive attack to single instruments. 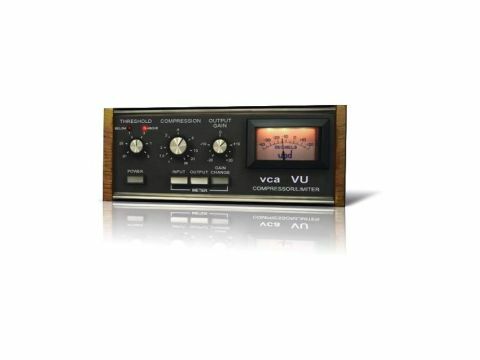 The VCA VU certainly stands apart from other compressor plug-ins due to its unusual character. If you're bored of fiddling with attack and release, or just want a truly classic compressor in plug-in form, this may well be for you.